The 1937 Packard 115-C Coachbuilt Cabriolet by Graber featured here is finished in stunning Chinese Red over a white leather interior and beige folding convertible top. It was one of a few Packard chassis that were imported by Swiss Importer Wener Risch in Zurich to noted coachbuilder Hermann Graber of Wichtrach. This Graber-bodied 115-C is one of very few built new and is one of only a handful known to exist today! This Packard was previously subjected to a full restoration around the 1970s. As one might expect the restoration is showing its age with patina in the chrome and paint work. This Packards very presentable condition today can be attributed to the 1,788 kilometers (1,111 miles) on the odometer; a number that likely reflects the total mileage driven since restoration. Most recently the Packard was part of a private collection in Switzerland. The custom coachwork qualifies this 115-C as a Full Classic by the Classic Car Club of America (CCCA) and would make and excellent showing at future events considering there are only around a dozen Graber bodied Packards known to exist today! We are especially proud to offer this incredibly rare 1937 Packard 115-C coach built Cabriolet by Graber to the most astute collector or investor who appreciates the great Packard marque and custom coachwork. Ready to make an investment that you can actually enjoy? Classic cars have proven to be among the most resilient and rewarding investments in recent years with the Historic Automobile Group Index (HAGI) jumping 39% in 2013, 16% in 2014 and 17% in 2015 while posting gains of 467% over the last 10 years. Please contact one of our expert sales consultants at (314)291-7000 or info@schmitt.com for more information. They will be happy to give you a complete walk-around, supply you with a more detailed description and answer any questions you may have. Buy with confidence. Carrosserie Hermann Graber in Wichtrach, Switzerland was founded by Hermann Graber once he took control of his fathers wheel manufacturing business in 1924. Graber was quick to transition the company from wheel making to custom coachbuilder with their first bodied car (a Fiat 509 Cabriolet) appearing in 1927. During the 1930s a selection of running chassis from iconic American marques such as Duesenberg, Hudson and Packard were imported by Wener Risch of Zurich who commissioned several one-off designs. Graber coachbuilt Packards were some of the most celebrated designs of the era as they successfully combined the stately American presence with stylish European flare. 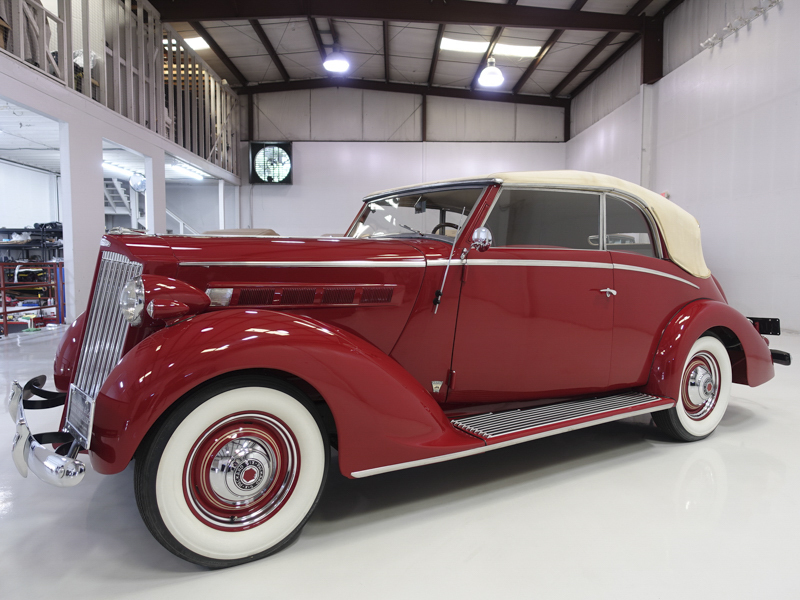 As little as seven different Graber bodied Packards are known to exist today with RM Sothebys selling a 1938 Packard Eight Graber Cabriolet for $1,760,000 in 2015! This 1937 Packard 115-C was listed for sale on 4-14-19 08:33:35. The vehicle color is Chinese Red and VIN is not available	. Kindly check ad for seller's location. Seller`s stock ID is danie407151_115C. There are 27 other Packard cars currently listed for sale on our website. You may desire to see what other Packard cars are selling for by visiting our Sales Data page.